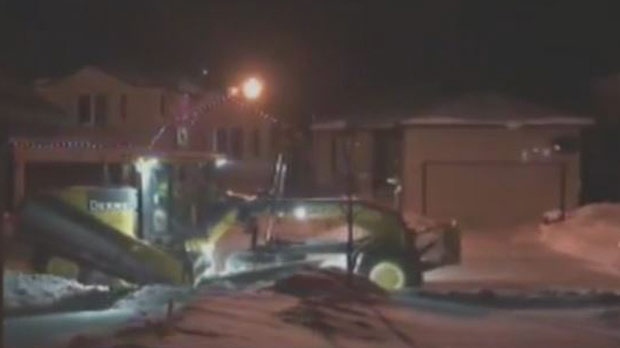 Snow removal operations this month have taken a toll on some Winnipeg yards but contractors don’t expect the damage to be as bad as two years ago. 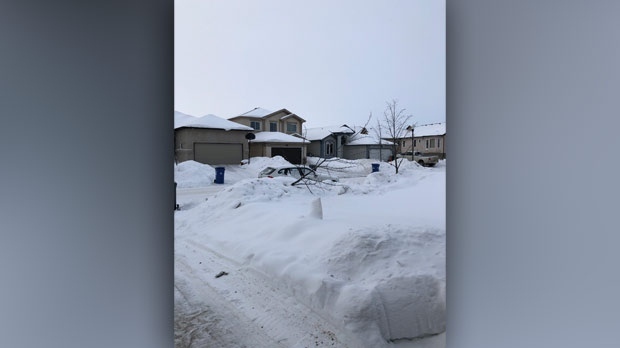 Lucky Chahal was recording video of snow clearing operations in front of his South Pointe home Sunday night when he captured footage of a grader taking out a small tree in his yard. Chahal said he wants the tree replaced. The city said if a property owner believes they have a claim against the city for damage involving snow clearing operations, residents can contact the city to file a claim. Winnipeg has been hit with around 25 centimetres of snow so far this month. That’s more than double the average snowfall amount for all of February which is around 12 centimetres. So far this season, between Oct. 1, 2018 and Feb. 13, 2019, the city has received 142 damage claims related to snow removal. In 2017-2018 there were 254 damage claims. That’s a big drop compared to the 2016-2017 season when there were 665 claims. To help reduce damage, the group which represents snow contractors has worked with the city on developing a new snow removal orientation for all operators. Kerry Minsky, president of the Heavy Equipment and Aggregate Truckers Association of Manitoba, said operators are given information on how to approach curbs, how to properly clear bus stops, intersections, fire hydrants and how to take the proper care and time to clear roads without causing damage. “Every operator plowing for the city this year, for the first year has to take that orientation prior to going to work,” said Minsky. “This year’s been a good year because we didn’t have any snow in November/December. Mid-December, I think was our first snowfall, the ground had time to freeze, your damage is automatically reduced” he added. “Two years ago we had extensive damage, we didn’t have any frost in the ground prior to the first snowfall and it was ridiculously bad but this year looks like it should be pretty good” said Minsky.